Taken on October 28, 2016, Cassini captured one of its last looks at Saturn and its main rings. Cassini has been orbiting Saturn for nearly a half of a Saturnian year but that journey is nearing its end. This extended stay has permitted observations of the long-term variability of the planet, moons, rings, and magnetosphere, observations not possible from short, fly-by style missions. When the spacecraft arrived at Saturn in 2004, the planet’s northern hemisphere, seen here at top, was in darkness, just beginning to emerge from winter. Now at journey’s end, the entire north pole is bathed in the continuous sunlight of summer. Images taken on October 28, 2016 with the wide angle camera using red, green and blue spectral filters were combined to create this color view. This view looks toward the sunlit side of the rings from about 25 degrees above the ringplane. 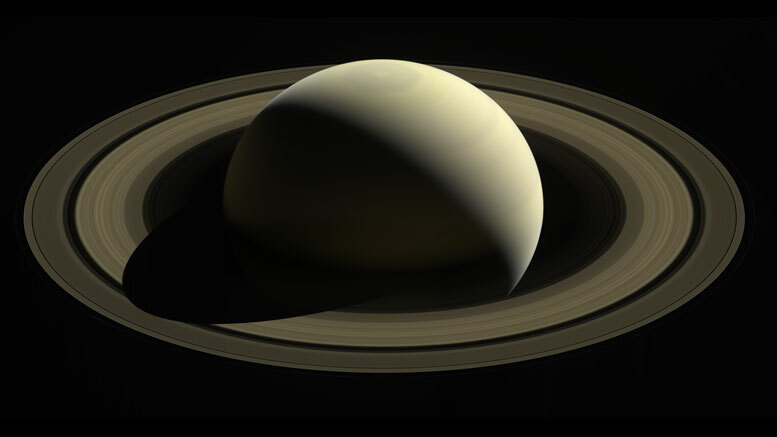 The view was acquired at a distance of approximately 870,000 miles (1.4 million kilometers) from Saturn. Image scale is 50 miles (80 kilometers) per pixel. Be the first to comment on "Cassini Spacecraft Captures One of Its Last Views of Saturn"